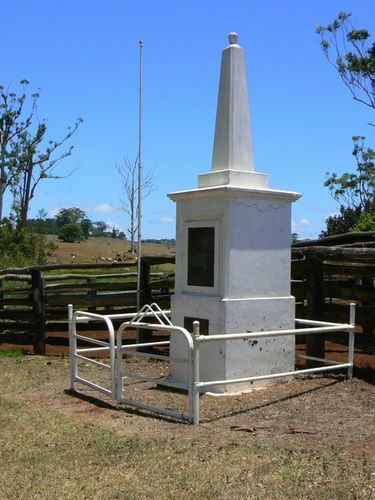 The Evelyn Scrub War Memorial was erected after World War One on land set aside for the purpose by Edward Daniel, c1919. It lists the names of all the men from the Evelyn district who had served in the war. Forty-one names are recorded on the memorial on individual brass plques including the name of an aboriginal soldier. The Memorial is in the form of a substantial pedestal supporting a narrow pointed obelisk topped with a spherical object. The entire monument is concrete. Forty-one names and fates of the men from Evelyn Scrub who served in the Great War are attached to an brass honour roll secured to one side of the pedestal behind a glass screen. The memorial also contains a plaque dedicated to the pioneers of Evelyn Scrub. It is the last standing structure at what was once the town of Evelyn, and it illustrates the growth and decline of farming communities in the evolution of the history of the Atherton Tablelands. On the 18th March 1917, a meeting was held in Daniel's Hall to arrange a dance in order to raise money for a memorial fund in connection with soldiers of the district who had fallen in the war. Cairns Post (Qld), 20th March 1917. On Anzac Day the local honor board was unveiled in the presence of a large number of witnesses. This is one of the first of its kind to be unveiled in the north, so Evelyn can rightly be proud of this fine memorial. The Northern Herald (Cairns), 23 May 1918.